Apologies for posting this so late in the day. It has been a pretty busy one so I didn't have the time to sit and get into the card. Having said that, I pulled the card early this morning and it stayed with me for the day. This is the first 'pull' that we have done that hasn't sat as comfortably as the others. There is something about this guy - something a little bland in comparison to the others. When I look at him, I see an old head on young shoulders. I don't like the way that his eyes are blocked out by the buttons and I don't like the open mouth. I don't like the round head. There are other cards that have buttoned out eyes but their personality seems to come through. I feel little to nothing for this page at the moment, and I have felt little to nothing from him all day. I am surprised because I have enjoyed all of our other daily draws so far. Am I the only one that feels this way? "Meet Twister, the Page of Coins. A character with a tendancy to fantasize, he is a poet, always looking for a new direction or an alternative way of gaining more control. Twister is not happy when life becomes routine. Twister, the Page, represents a time for improving oneself, the motivation to try new things. The reversed meaning of this card is 'talking rather than doing, ignoring opportunities'". I really have little to add to this one because I can't, at this moment, see any of these characters in Twister. Hopefully, one of you may be able to help me adjust to his energy. The definition is spot on as a daily draw card and with relation to my own life. I just don't see any of it in the image. I agreed with you at first, Yaboot, because the button eyes really threw me off, and the mouth was kind of gruesome. But when I read the definition, my first thought was that the buttons were like 'stars in his eyes' or 'rose-colored glasses', that they represented the dreams he has, and the visions of possibilities he sees. His open mouth is probably in the middle of saying, "Oh Wow!" 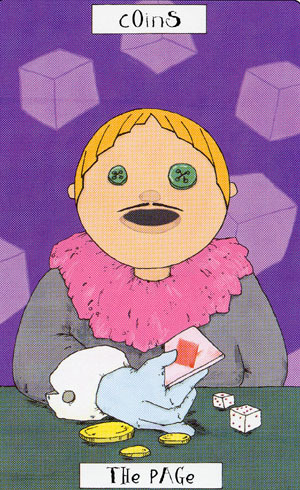 The cards and dice and coins indicate to me the gamble he is willing to take to reach his dreams is pretty 'high stakes'. I never liked this card much either so i kindda made my own view. Melvis al ready said that the card he is offering is is an opportunity. Because i don't like his face...i always see that opportunity hidden in something i don't like. or offered in a way that i don't recognize it. Oh dear, Twister sounds a bit like me. Why is he called Twister I wonder? Maybe he's like those goofballs at parties, who always want to pull out the big plastic sheet and play the game Twister because it's "fun." Oh yes, we know those kind of guys. "Hey, let's do this, it will be fun!" they exclaim while you're trying to have a serious conversation about the development of silicone chips, and the influence of Tolkien on computer programmers. Yes Twister, whose empty, gaping mouth foretells of the delights to pass his lips. He's the guy who always says "How come you aren't drinking, come on have a drink, you're no fun," as he proceeds to round people up for a friendly game of euchre. He's all frilly collar and carefully waxed moustache with a big, black hole for a mouth. His hand is blue, it's lost circulation while holding out a card waiting for someone to come and play with him. Someone started to read a beautiful poem by Louise Glück and he immediately opened his mouth to tell you about HIS poetry. His eyes are green with envy because he won't stick to anything long enough to develop his own talents. He's seriously thinking of cutting a rap album under the name T. Cube, so he can put a backbeat on his poems and reach a wider audience, preferably one that likes euchre. He'll tell you about it if you like, he's pretty good at telling people stuff. Is that a black fly in his mouth? "Hey, he shouts, what are you guys doing over there......" and you quickly hide behind the curtains and pretend you aren't in the theatre in a mad hope that he'll go away. Yup, maybe there's a bit of Twister in us all? Maybe we were separated at birth? I think that Twister came into a bit of unexpected money. Maybe a nice relative gave him more than the usual because he turned 18 this year (the total number of spots on the dice). He's so excited by the possibilities that his mouth hangs open. He is twisting about in his mind all the ways he can spend it (not being a King, or even a Knight, saving it does not cross his mind). The card and the dice represent these possibilities. Once the card is turned or the dice thrown (or the money spent) the thrill of speculation, the shear joy of feeling RICH, will be gone. But right now, his imagination is fired up; some earthly wish, some desire, can be fulfilled; but which one? This is the magic of unspent potential. I did a reading about the feelings of my friend G. for my friend B., and the Page of Coins popped up. Here's a link to the card. I didn't get much out of Twister either, but that's actually a bit appropriate considering the situation: G. is the kind of person that's very hard to read, keeping his feelings mostly to himself. (Which is also, in a way, reinforced by this being a Coins-card.) And since this is a Coins-card, I'm thinking the friendship between G. and B. is solid and strong. For some reason Twister's mouth reminds me of the slot of a piggy bank, and, yes, both G. and B. have invested a lot in their friendship and it's worth a lot to them. Since there are reasons to believe G. is developing romantic feelings for B., my eye is drawn to the playing card, the coins and the dice. It really seems like Twister is ready to gamble--it makes me wonder whether G. is toying with the idea of taking a risk after all, of taking the friendship to another level. Pages are usually the ones eager to try out new things, and Graham did call him "Twister".